The Vulnerability Reduction and Shock Engineering Team is part of the Naval Authority Group within the Defence, Equipment and Support (DE&S) of the UK Ministry of Defence (MOD). The Vulnerability Reduction and Shock Engineering Team’s primary role is that of subject matter experts within the MOD on vulnerability reduction and the effects of maritime weapons on ships and submarines. As part of this role the group develops and manages vulnerability reduction policy on behalf of the Above Water Capability Team [or Sponsor], CAP(AW), and provides advice and guidance to platform, weapon and equipment project teams, as well as operational commands in theatre via Navy Command Head Quarters and the Maritime Warfare Centre. The group advises project teams at all stages of the CADMID lifecycle, from concept development through to in-service and, in some cases, disposal. The advice provided is highly specialised and as such the Vulnerability Reduction and Shock Engineering Team is supported by specialists from QinetiQ’s Marine Survivability Services team. QinetiQ’s services are delivered as part of the Maritime Strategic Capability Agreement (MSCA), a £200m, 15-year contract, which was awarded to QinetiQ in 2009. This agreement secures the MOD’s access to a range of maritime engineering and scientific expertise and facilities. "One of our key tasks is to ensure that we maintain a high profile for survivability and specifically that of vulnerability, as a critical consideration in the development of new ships and submarines," observed David Manley, Head of Vulnerability Reduction and Shock Engineering Group, MOD. QinetiQ has been providing support to the Vulnerability Reduction and Shock Engineering Group since the formation of QinetiQ in 2002 (and before that as part of the Defence Evaluation and Research Agency, DERA), based on a combination of its understanding of the many aspects of survivability supported by a powerful and proven integrated software tool – Survive®. QinetiQ provides two primary areas of support – assistance in the management of policy, strategy and guidance to the project teams and the provision of rapid response decision support to assist vessels operating in theatre who are seeking to understand specific threats. "QinetiQ’s Marine Survivability Services also play a key role in conducting forensic assessments of real world incidents, for example to help us determine what type of weapon may have caused a particular instance of damage. Analysis also ensures we learn from the incident. The expert team at QinetiQ provide us with tools to analyse the incident and can tailor the code to generate the specific information we need," said David Manley. A key component of QinetiQ’s service is the in-house developed Survive software. 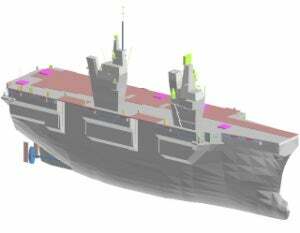 Capable of dealing with all types of vessels, both surface and underwater, it’s fully integrated functionality allows models to be built and then assessed using code that has been thoroughly validated against hundreds of tests and real life trials from small scale to full scale seagoing tests. "QinetiQ have expended considerable effort in making Survive a ‘best in class’ tool for the work we do. It covers both above and below water scenarios involving ships, submarines, weapons and personnel. They are continually improving the way results (which are based on vast amounts of data), are presented in a user friendly manner. Having one tool on which to build all our models is highly cost effective, provides configuration control, and a single point of contact for us to work with," commented David Manley. At the core of QinetiQ’s Marine Survivability Services is a team of specialists who have built an extensive knowledge of the business of survivability and specifically vulnerability. Using Survive they have built models of all the major Royal Navy vessels in the 21st Century.